Rockingham County Senior Games TENNIS competition at the Eden Family Y. Mens Singles and Doubles and Mixed Doubles begin at 6pm. 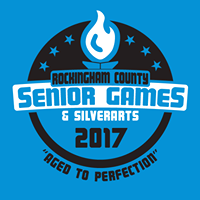 Calling all tennis players 50 to register for Rockingham County Senior Games Tennis. Here's everything you ever wanted to know about playing tennis in the Senior Games...but mostly, remember, it's a great way to get on the courts together playing the game we love. Participant's age on December 31, 2017 determines the age category in which they will compete at the Local Game and State Finals. In individual sports, participants will compete in age groups based on 5-year increments. (50-54, 55-59, 60-64, 65-69, 70-74, 75-79, 80-84, 85-89, 90-94, 95-99, 100 ). Rockingham County will use the 8 game pro set format for all tennis events. Paper registration packets are available at senior centers and YMCAs across the county. $10 paper registration fee. Senior Game Tennis Rules attached. Click to view the NC Senior Games Flyer.